Beans of the genus Phaseolus are an important source of protein for many people around the world. 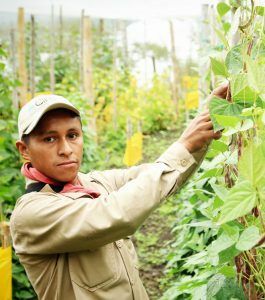 Beans are one of the most economically important crops for small farmers in Latin America and elsewhere. In sub-Saharan Africa, more than 200 million people depend on beans as their most important pulse. Beans are grown for their green leaves (often fed to livestock), and immature pods and seeds, but it is the dry seeds (which are nutritious and store well) that are the primary end product. The genus Phaseolus has a unique evolutionary and domestication history. It contains five domesticated species: P. vulgaris (common bean), P. coccineus (runner or kidney bean), P. lunatus (Lima, butter or sieva bean), P. acutifolius (tepary bean) and P. dumosus (acatalete, botil or year bean); which were the result of seven domestications, with P. vulgaris and P. lunatus probably undergoing two independent domestications. P. vulgaris is one of the most economically important legumes in the world. The species probably originated in central Mexico, and dispersed to South America before it was domesticated. As a result, the wild genepool of the Andes was exposed to an early genetic bottleneck. Three wild genepools are recognized for common bean: the Mesoamerican, the Andean genepool and the northern Peru-Ecuador genepools. In Mesoamerica, the common bean was probably domesticated in the Oaxaca Valley. This is supported by archeological bean remains from 2100–2300 BP. The geographic location of the Andean domestication is still disputed (two candidate sites are southern Peru or southern Bolivia and northern Argentina). Common bean, together with maize and squash (Cucurbita pepo), make-up the “three sisters”, which were fundamental to the development of pre-Columbian communities in Mesoamerica. Of the major food crops, beans, and especially common beans, are among the most variable. Growth habit, seed size, shape and colour, days to maturity and many other factors vary across varieties. There is hidden diversity too, not only in resistance to pests and diseases but also in the nutritional value of the seeds. CGIAR Centers, notably CIAT, have been instrumental in breeding beans that are more productive and more nutritious, benefitting millions of households. The common bean is mainly self-pollinated; however, many authors have reported outcrossing or natural hybridization in both wild and cultivated populations. Although outcrossing is sporadic, it is necessary to take some precautions during regeneration to maintain genetic integrity. Genesys lists almost 117,000 accessions of Phaseolus: 86% P. vulgaris, 4% P. coccineus, 6% P. lunatus, 1% P. acutifolius and 0.5% P. dumosus. About 65% of the accessions are traditional cultivars or landraces, with 15% improved cultivars and 3% wild relatives. The International Center for Tropical Agriculture (CIAT) holds the largest Phaseolus collection, with almost 40,000 accessions, followed by the USDA-ARS genebanks with nearly 18,000 samples and the Leibniz-Institut für Pflanzengenetik und Kulturpflanzenforschung (IPK) with more than 10,000 samples.